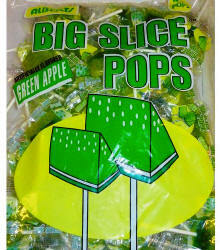 Big Slice Green Apple Pops 48ct - $6.50 - Other Albert's Big Slice Pop flavors include Watermelon, Blue Raspberry, Cherry, Strawberry, Peach, Pineapple, Green Apple in 48 pop bags. 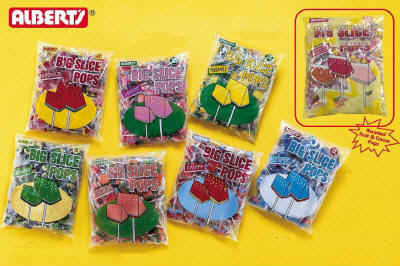 These wedge-shaped lollipops aren’t afraid to be themselves, because they know it’s what’s inside that counts. And what’s inside is mouthwatering green apple flavor that rivals any “round” candy out there. So don’t shun this candy because it looks different! It’ll quickly become one of your favorites!